A truly classy Citroen. The C4 Cactus. A truly classy car from Citroen. The C4 Cactus. Jeremy Webb took the Citroen C4 Cactus on a trip through the New Forest. Discovering the delights of the car and nature. Citroen has produced a classy car in the form of the C4 Cactus. It looks great and delivers exactly what it sets out to do. Transport its occupants in comfort, safety and style. Labelled a mini SUV, it certainly lives up to this with its capabilities to provide good handling and performance, along with comfort and safety. Citroens have always been known for great suspensions giving a superb ride to passengers. The C4 is a perfect example of this, as it soaks up the worst of the UK roads as well as some off-road trails I took it on in the New Forest. That was a lot of fun. They use Progressive Hydraulic Cushions which add a stop on both compression and decompression of the suspension. Comfortable seats with lots of options for colours and trims. The inside of the cactus is roomy, comfortable and practical. There are a variety of options with interiors as there are for car colours and trims. Citroen wants the buyer to have many options to get their own personality into the car they are purchasing. It makes for a stronger manufacturer, buyer bonding. Storage is good with large front door pockets, top box in the dashboard, rear door pockets capable of holding bottles, cup holders and open storage towards the top of the rear doors. 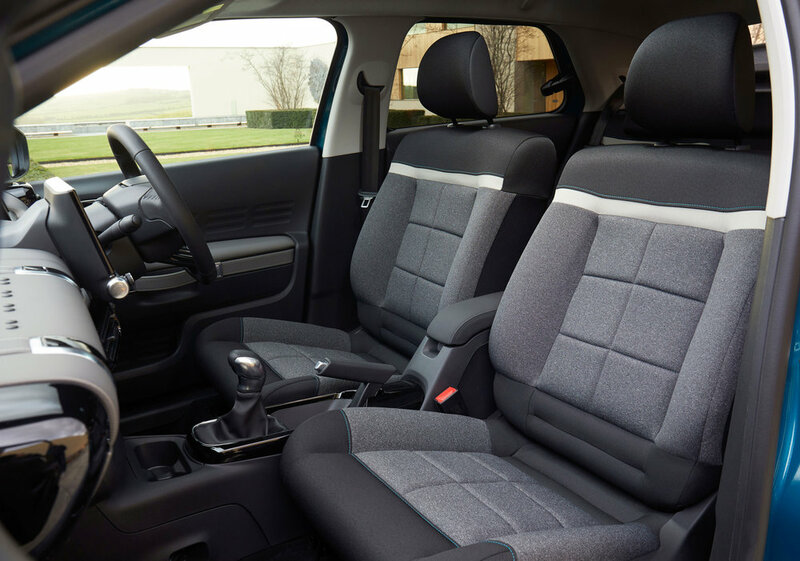 Passengers have plenty of room and comfort in the C4 cactus. The car I had was the C4 Cactus Flair, Blue HDi 100 with a manual gearbox. The cockpit was good with all displays easy to read and plenty of information given to the driver. It comes with lots of technology and safety equipment as standard. Citroen gives you a lot for your money. The price of my car is £21,040. It was a manual box with five gears. Top speed 118mph and 0-62mph 10 secs. It has a 45 litre fuel tank and on an Extra Urban run delivers 90.1mpg, which is so impressive. The gearbox is smooth with positive changes easily made. It allows you to push the car along at pace when required and you always feel fully in control. It is never going to negatively surprise you. It controls on the steering wheel to change channels, volume and information settings. Touch drive interface which is 7" gives a clear display of media, Sat nav and reversing monitor. It is a versatile car with the ability to fold seats and increase the loading capacity in the already mentioned spacious interior. The C4 Cactus has 12 driver assistance systems, providing extra reassurance and safety in day-to-day driving. This can be fighting against drowsiness through an alert suggesting a coffee break or preventing the risk of accidents from slight errors either from the driver or other road users. i.e. The driver attention alert system which warns the driver of the possibility of an accident to support the driver's own eyes. Passengers have three connectivity systems to enjoy ate and simply relax thanks to Citroën Connect Nav technology, the Mirror Screen function with Android Auto, Apple Car Play™, MirrorLink® and Citroën Connect Box. The C4 goes up against the likes of the Nissan Juke, Kia Stonic and the Arona from Seat. It beats these with its standout looks and owner choices. The ride is far superior too. 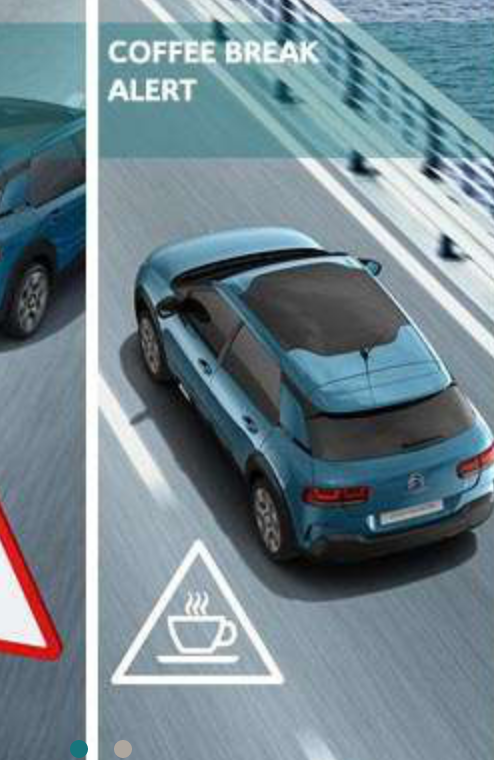 I prefer tea, but love the idea that the car suggests taking a break from driving. Summary: Well priced in the small SUV / Hatchback market the C4 Cactus is a classy car which does everything well. Offering great comfort and ride. It is fun to drive and has plenty of space. It is loaded with specification and technology for safety, improved driving and entertainment. Running costs are low, with great MPG figures, low insurance and servicing costs. Citroen has made the C4 Cactus a desirable car.